Two of the most common forms of Network Address Translation (NAT) are dynamic Port Address Translation (PAT) and Static NAT. PAT is the many-to-one form of NAT implemented in many small office and home networks where many internal hosts, typically using RFC 1918 addresses such as 192.168.0.0/24, share a single external address on the public Internet. Static NAT is a one-to-one mapping which is used when an internal host needs to be accessible from the public Internet or some other external network. In this blog post and video, I'll explain how to configure Static NAT to make an internal Web server accessible from an external network. The same concept applies when you want to make any internal server accessible from an external network, whether it's a Web server, a mail server, an FTP server, or any other type of server or device. This video and documentation is based on ASA software version 9.0(1) and applies to version 8.3 and later. Use the following diagram with this documentation. This diagram uses RFC 1918 addresses. In the real world, the outside interface would most likely be configured with a registered, public address. There are four steps involved in enabling Static NAT. Create an Access-Control List to permit the traffic flow against the security level from outside to inside. Apply the Access-Group to the outside interface. When successfully implemented, this configuration will permit a host on the outside network, such as the public Internet, to connect to the internal Web server using the address on the ASA's outside interface. Configuring the ASA with Multiple Outside Interface Addresses It is not possible to assign multiple IP addresses to the outside interface on a Cisco ASA Security Appliance. It is possible, however, to configure the ASA to forward different outside addresses to different hosts on the inside network. For example, you have a /29 block of addresses assigned by your ISP. Also, suppose you have a mail server using POP3 and SMTP and a Web server using HTTP and HTTPS on the inside network. You want each of the servers to be reachable via different outside addresses. You can configure static NAT to accomplish this. Use this diagram with the documentation. As above, in the real world the outside interface would probably be configured with registered, public addresses instead of the RFC 1918 addresses shown here. Configure a network object for each internal host with a static NAT static statement specifying the outside address to be used and the service types (port numbers) to be forwarded. Configure access-control lists to permit the traffic flows. Apply the access-control lists to the outside interface with an access-group statement. Note: In the above configurations, the host statement identifies the internal server (192.168.102.5 is the Web server and 192.168.102.6 is the mail server). The NAT statement identifies the external address used to forward the specified packets to the internal host. This Access-Control List permits the traffic flows against the security levels (each access-list statement goes on a single line). 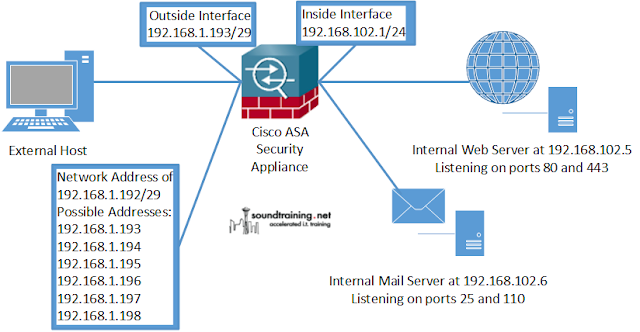 For more information about configuring the Cisco ASA Security Appliance, please see my book The Accidental Administrator: Cisco ASA Security Appliance, available through Amazon and other resellers or through the soundtraining.net bookstore. Also, consider attending my Cisco ASA Security Appliance 101 workshop, either a public, open-enrollment workshop or available for onsite training at your location with your group. More information is available here. Don R. Crawley is a longtime geek and President/Chief Technologist of soundtraining.net with more than 35 years in workplace technology. He holds multiple technical certifications and is the author of numerous books on information systems and technology, including The Accidental Administrator: Cisco ASA Security Appliance. He has spoken to audiences worldwide on both technical topics and IT customer service. His clients include well-known names such as Facebook, Kraft, Discover Card, Colgate University, State of Washington, State of California, City of Los Angeles, Perot Systems, the United States Pacific Command, the US Navy, Mercy Corps, and hundreds of others. To view this Seattle IT pro's upcoming events or to receive free Cisco tutorials, Linux tutorials, IT customer service tips, and other guides that will help you with Cisco training, Linux training, customer service training, and other skills you need to know to build a great career in IT, visit www.soundtraining.net or contact us at don@soundtraining.net or 206-988-5858.